Click above to download a 17 page extract. FRANK CHALK is an ordinary teacher in an ordinary British school...a school where the kids beat up the teachers, get drunk and take drugs - when they can be bothered to turn up. 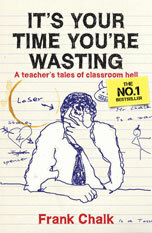 It’s Your Time You’re Wasting is Chalk’s bleak but blackly humorous diary of his final year in the modern education system. He fights apathy (his own and everyone else's), battles the tearaways and worries about the few conscientious pupils, recording his experiences in a dry and very readable manner. He offers top tips for dealing with unruly children and their parents, muses on the shortcomings of the staff (including his own) and even spots the occasional spark of hope amid all the despair. His book will horrify (and amuse) millions of parents and will become a must-read for many of the country‘s 400,000 teachers. Frank Chalk is a pseudonym. He taught for ten years in comprehensive schools in an English city before being driven out of teaching this year by a combination of fear, despair and anger.